This is the first installment of certainly the most illustrious Corner Crew in Oklahoma Region history, and perhaps in the Midwest Division. Its name is from an Oklahoma Region tradition founded by David Dooley's crew at Ponca City in the early 1960's. At the dropping of the last chequered flag of the day, open bottles of "Cold Duck" (1/3 red wine, 2/3 sparkling white wine) would be passed around in a circle until emptied. 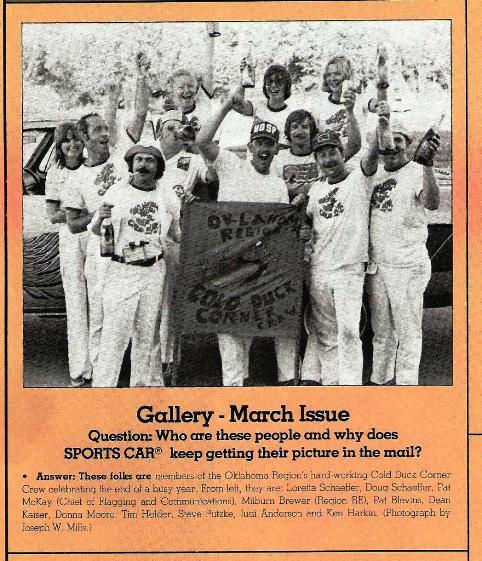 The tradition spread to the corner workers and by the 1970s the Cold Duck Corner Crew (CDCC) was born. Monthly reports and stories of the CDCC exploits all over the Division were published in the Gazette. Additional articles and stories will appear in the Gazette to document the legend and lore of the Cold Duck Corner Crew. This photo is from the April, 1978, Sports Car magazine wherein its editor expressed exasperation at receiving multiple letters from the CDCC demanding recognition.